We are having this tonight with our friends Andrew and Peggotty who are here for a few days rest and recuperation! Meredith says it’s not really from the Mediterranean region so what’s it doing in the cookbook?! She’s right–it’s more Cajun than Med. I think–but it’s healthy and tastes good, so…! 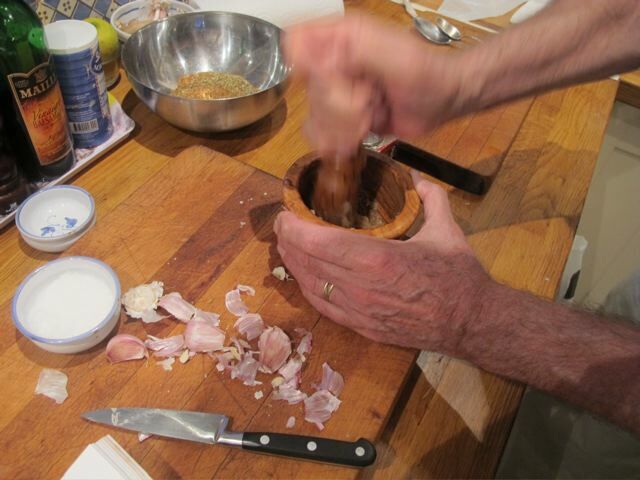 It’s also a good dish for company–easily adapted to feed more than four. Allow 200 g/7 oz of salmon fillet per person. 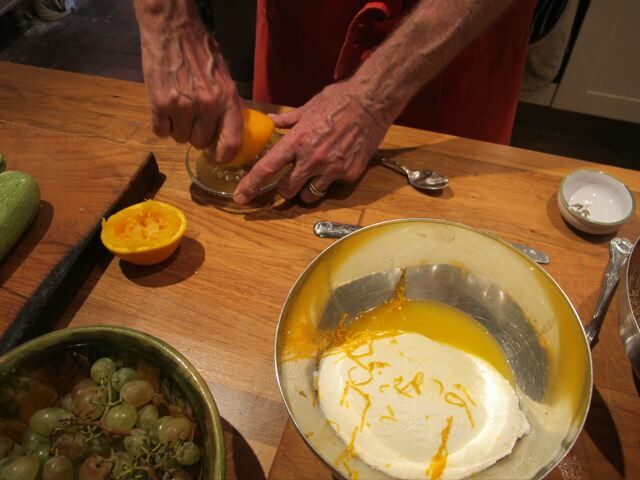 Make the sauce by whisking the olive oil into the yogurt, followed by the zest and juice of the orange. Set it aside. the small bones have been removed. Cut up the salmon into squares roughly 3 cm/11/2 inch in size – they need to be cooked quite quickly so mustn’t be too large. Put them in a bowl and add the olive oil. Turn the salmon carefully until it is well covered. 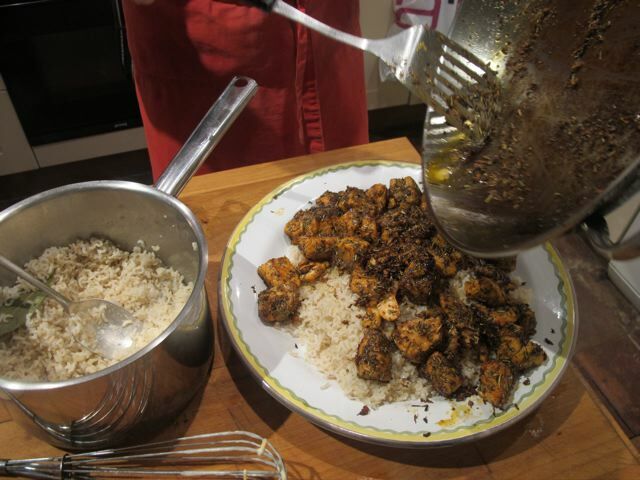 Tip the salmon into the bowl with the herb and spice mix. Again turn the salmon carefully until all the pieces are well covered in the mix. Pour a couple of tablespoons of oil into a large frying pan. When hot transfer the “blackened” salmon to the pan and fry for 4–5 minutes. continue to cook a bit off the heat. Serve over a steaming dish of brown basmati rice. Capt’n: Could you please come to Madison, Wisconsin, or at least Chicago, for a book signing? Really enjoy your website. We are big fans of Poldark. Just started watching Season 2. Chicago is Meredith’s home town and plans are afoot! Are you able to get wild-caught salmon in southern France, Robin? They have lots of farmed salmon here in NZ, but it’s very difficult (and expensive) to find wild. I like it better, but I think farmed would work well for this recipe. Bookmarked this one for the next time we have company! It sounds really delicious. Yes we can get wild salmon sometimes–it’s expensive though. Looks great, and we will be trying this for this evening! I am not usually a fan of yoghurt, but since this is smoothed out with the oil and orange juice, sounds very palatable! Were the Cajuns not originally descended in some from from the French settling in Louisiana and Canada? Could “justify” the menu’s inclusion in your book! In any event, it sounds delicious! My “London” copy of the book is now bedside reading and the “Bath copy” has clear DO NOT REMOVE label on it to stop anyone pilfering it! Hadn’t thought of that for an answer to the sceptic!–good point, Rosalyn. on October 5, 2011 at 11:14 am | Reply Dianne P.
Boy, that looks good! Any suggestions for what other fish it might work with, though? Hubby’s not very fond of salmon. Wondering if sole or even scallops might work?? It’s worth a try with fish that hold their shape and have a natural thickness to the fillet. The more delicate flavour of white fish may get lost. I’ve never tried it with other fish but I will. I’ll check out Beausoleil–which is a good description of the weather conditions here at the moment! This looks delicious! Can’t wait for my cookbook to arrive, which I believe will be soon! I love the name Pegotty. Reminds me of David Copperfield! This looks delicious,- fish with a kick, does it matter where it came from it’s the taste that counts.Thank you once again you have just solved a rather tricky problem for me. of what to serve to some special guests at the week-end. 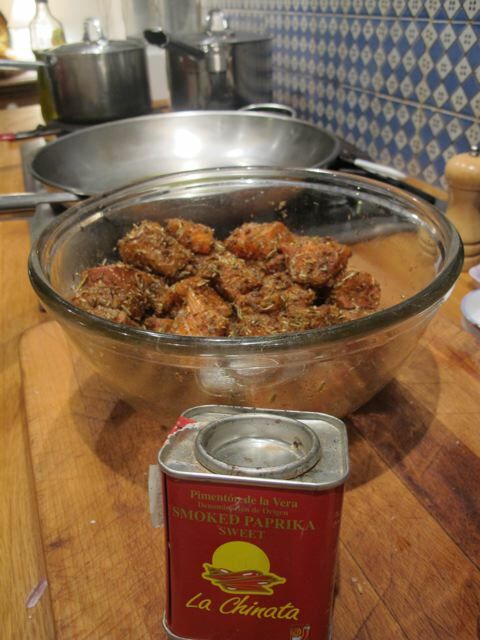 on October 6, 2011 at 11:25 pm | Reply Pat H.
Love your recipes and delightful blog. Discovered it when my son surprisingly was diagnosed with Type 2 Diabetes at age 21 ( he is slim and ate relatively well at the time). We have virtually eliminated the ‘bad’ carbs and sweets and it has benefited the whole family. 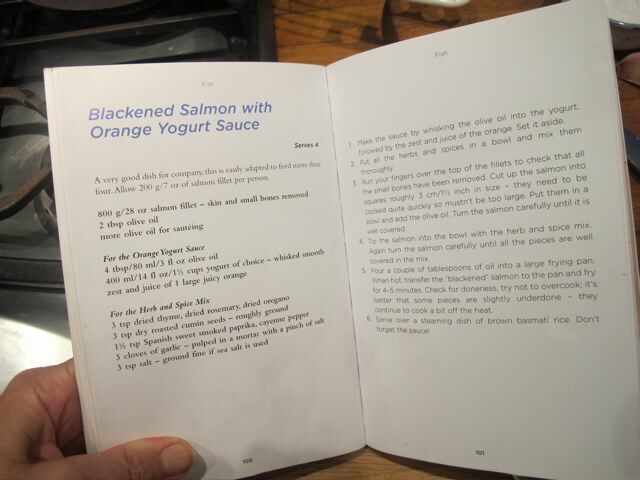 Quick note: made the blackened salmon with the orange yogurt sauce tonight. Would have been delicious if not for the saltiness. I questioned the 3 tsp but followed the recipe. One teaspoon would be more than plenty…do you remember how you found it? Thank you for sharing, such a pleasure to read about all your adventures, culinary and otherwise. That is young, especially as he is slim and eats well. Maybe the rest of the family might get tested. Sorry about the salt–I’ll check it out.